John Micek out in Allentown has a story on some tax lobbying in Pennsylvania that is expected to be a core contention in the upcoming state budget debate. There is also a bit of news that the state is hiring a bunch of new well inspectors to keep up with drilling activity across the state. I would still like to know what drilling is being planned within city limits. I just now catch a story I didn't see at the time in the PBT last year detailing some potential drilling right in the heart of Lawrenceville. I had heard those thoughts which I attributed to rumors. I couldn't quite believe it was possible even though the solicitations talked about in the article I received myself... and it had not been the first such soliciation I had recieved for the record. Just begs the question. What is the status of that drilling, and what other parcels in the city are on the short list for drilling? It would be news if plans were progressing or if they have been abandoned I would imagine. Buzz of this started a few days ago, but Trib today has a piece suggesting Pittsburgh might wind up being the venue for the 9/11 trial of Khalid Sheikh Mohammed. Today the WashPo has a piece pointing to a potential $200 million dollar a year price tag to have the trial in Manhattan. Together the two pieces get you thinking. First off... a quote of $200 million per year? Beyond the number itself which probably isn't unrealistic for anything in Manhattan. It works out to the bonuses of a few bankers really. But the temporal reference. I suppose it really is realistic to think of this all lasting for years, as in plural. As for the economic impact... maybe the Common Plea will wind up running a daily 'Federal Marshal Special'. But when you think about it there is enough logic to think it will happen. The connection with Flight 93 no doubt. The logic that probably helped bring the G20 included the topography of Downtown which made it a bit easier to secure than a lot of other places... and then there is the simple argument that the administration could show up with and say we owe them one for the G20 itself. It is all clearly not a zero probability event. So we could be the center of publicity for much of the world for an extended time... such is the Yin and Yang earned media. My inner prognosticator feels like it could actually happen... but the betting man in me would place odds on that Northern District in Virginia which has some experience dealing with high profile cases just like this.... we will see. Would it be cheaper to build a Maglev with wheels? I bet some politician will ask a question like that. I've heard worse. Anyway, where could I go with news that Maglev was left out of any funding*... So if you go across the whole history here, we imploded over an attempt to build Skybus which was a novel transit system using rubber wheels on a guided track while Maglev without wheels at all has defined inertia for decades. You wonder why we don't ever try the normal thing and build or use boring rail lines. We just have to be different. Oh yeah, no money for rail either now. Thus is the state of transit strategy in Southwestern Pennsylvania. If your strategy was to actually not expand transit options would the results be any different. You would think the maglev folks would get something just as a reward for sheer tenacity at this point. You can call up my past Maglev related comments here. There was a moment in time not too long ago when the ethereal Maglev project looked like it might actually happen. Just before 9/11 there was momentum for an actual demostration project with real money for maglev. Pittsburgh had been declared one of two finalists along with a plan to build something from DC to Baltimore. An actual draft environmental impact statement was put out there which was a real step toward something concrete (pun intended). Retired PG transportation columnist Joe Grata even dubbed it all "High Speed Maglev Week" at the time. It looked like a light at the end of a long tunnel. On top of it all the folks in Maryland did not seem to be keen on the impact construction of the line would have through the endless exurbia that now seperates DC and Baltimore. A Pittsburgh maglev almost (well, almost almost) seemed inevitable. It was not to be. Long ago Pittsburgh lost any bragging rights to have the first operational maglev even if it had been built. Shanghai's maglev line is up and running and has been for years. Shanghai actually built theirs with Transrapid technology, a German company that was slated to build the Pittsburgh high speed maglev. One problem is that Transrapid announced it was shutting down last year. It didnt go away immediately and I am not sure what the status is, but there is a great writeup of Transrapid's history in the Indian press (why not? flat world and all of that) just last week. As of more news today.. and as best I can tell the Germans are still trying to keep Transrapid from fading away completely. * High Speed Maglev that is.. have not heard from either of the low speed maglev projects that have been talked about in town. One out at Cal U and the other that I think was going to connect Downtown with parts of the lower Hill District I thought... have to go look that up. Someone should check in on them to see what traction they have remaining. More on what Jim R. spotted the other day... Bloomberg follows up on the report showing Pittsburgh with the largest discount of foreclosure sale real estate in the nation. (Not quite sure what the benchmark universe is).... I think we can show pretty clearly that dynamic is very concentrated in certain neighborhoods and communities. but the same report shows us with foreclosure sales here as the lowest percentage of all sales. Big topic... but Las Vegas = 74% of all sales are foreclosure sales... Can you imagine? It is hard not to laugh at the suggestion we need to build a groundhog robot in order to keep from disturbing Punxsutawney Phil's sleep and related alleged atrocities. You have to admit, though, that a robot might do a better job at actually predicting the end of winter. Speaking about Phil.... This is from a few years ago, but for new readers: I really thought Phil was fired a few years ago. I guess not. When does the 2nd most famous groundhog in Pennsylvania get his due? Update: Hey look, I'm not the only one thinking this..... in video no less. Hilarious. and just curious if anyone has taken the Pittsburgh to Paris flight of late?.. I'd be curious on prices for tickets and capacity utilization. and just so people don't accuse me of ignoring 'good' weeks at the casino... check out my casino watch. Of course even on anomalously good weeks, the revenue rate if sustained is still a fraction of what was predicted and I think still less than half the rate necessary to directly generate $10 million a year in taxes for the city. It really is about time for a news story to ask the question what they do down there financing wise when their interest rate reserves run out which by their own admission is going to happen pretty soon now. Folks who get PG+ saw that they had an update the other day on the ongoing saga otherwise known as 'Who owns lukeravenstahl.com?'.... they don't know, and neither do I but there was some form of ownership change and a change in format at the very least. Ownership is completely obscured by some form of domain anonymizer. But readers here learned that 7 months ago. Anyone want to own up to buying the domain and disclose what they had to pay? Speaking of domain names, more than a few potential political candidates being talked about with some obvious domain names un-bought as of right now. Hint. Hint. and I didn't catch this, but Jim R. points out how Zillow has a curious factoid in a report showing that of all foreclosures they looked at, foreclosures here typically sold at the biggest discount compared to non-foreclosed homes.. and he is asking why. Any answer I could suggest would be long, but it may not be uncorrelated with the news item I pointed out the other day from the Wall Street Journal. They were highlighting the success of foreclosure abatement programs in Pennsylvania. That and since actual foreclosure counts have been declining for 3 years now I think, the foreclosures we do have must be highly selected compared to foreclosures elsewhere. That and I don't quite trust Zillow's ability to model comparable homes for that type of comparison. Our experiences with assessments shows that what computer models think are perfectly good comparables may not be comparable in reality. It just gets to the odd ways we live and cluster all around. and few will care about this I know, but I am obliged to point out a post over on IHeartPgh about some letterpress printing demos coming up. What is Letterpress printing? Lead+Ink+Paper. Not really all that much different from Gutenberg's 15th century innovation. My father was a letterpress printer back in a day when there was no other type of printing and my only legitimate manual trade skill may in fact be in setting type. Long ago that is. It is a complete coincidence that there is a Briem Font created by Icelander Gunnlauger Briem. I forgot. Yesterday was the anniversary of the City of Pittsburgh's wage tax. An ordinance for the new wage tax was passed on January 25, 1954 by a vote of 8-1. The lone dissenting vote was from then councilor, and future city council president John F.Counahan, a plumber from the North Side. It provided a temporary reprieve for the city's budget... 9 years later it would impement a novel parking tax as well. and not to bring up the whole tuition tax imbroglio..... but I see a related historical note that the city did in fact once try to pass an "institution and service privilege tax" decades ago on both hospital admissions and college tuitions. What happened to it? It seems the hospital part was implemented first and was thrown out in court. So what goes around comes around. Can you spell p-r-e-c-e-d-e-n-t? Pennsylvania Mortgage Relief Wins Fans: Some See a Model for the Federal Effort to Rescue Troubled Home Loans in Long-Running State Program. I really am thinking that this is not about to happen, but what do I know? Maybe there really is basketball in the 'Burgh's future. There are 128 comments no less as of this moment on that bit of commentary from Detroit. and file this under 'things that go missing': I am surprised I didnt see any local news about this near calamity. Possible that I just missed it. The Sunday PG is making a big deal of how the paper is getting into Twitter..
OK. innovation in journalism and all of that.. but the PG Newsroom Twitter Feed lists as one of the very few feeds that it is 'following' as NASA's Asteroid Watch. Should we be more worried than we are, or are they really really pessimistic? Joking aside... I have to admit I didn't get twitter.. still don't I am sure. But folks like Mayo have done some neat things as journalists on Twitter. Can you imagine the following if the folks doing spot reporting were twittering as they went along during the day. Most journo-twitterers I see are really just using it as an alternative medium to advertise final news stories. Granted who knows how they would have time to do more, and the whole idea of 'scooping' the competition would become something different. Some fine line between teasing stories and giving away ones work I suppose. But when looking to see what was the latest news on the whole orphan story last week I was fascinated when I saw that Fox News producer Adam Housley, who was tweeting regularly from the Port au Prince airport, just started commenting out of the blue that Ed Rendell was there on the tarmac inexplicably. As best I can tell, it was the only real coverage from the ground there on the whole situation.. everything else we read kind of after the fact or filtered back through folks like the governor's spokesman or others. Is that part of the future of news? Didn’t we just get done with an election? It’s that time again and you can pick up your petitions for the spring primary now. A couple weeks ago the PG passed on a ‘tip’ in PoliticsPA that recent mayoral candidate Dok Harris is rumored to be considering a run against Jason Altmire for congress. Given the spasm to show he wasn’t a Sewickly resident, but actually a city resident it seems a losing proposition to reverse course and now try and claim he is not a city resident. Could it be that the story got a bit convoluted along the way and there is a congressional race in his future… just not against Altmire? Locally the free for all looks like it will be for State House 20 which is to fill the seat left by Don Walko who is now a judge. The Post-Gazette reported last week that the mayor confirmed his brother Adam was to be a candidate. Lady Elaine has commented here and tweeted that the other expected or likely candidates include Dan Keller, Mark Purcell, Paul McKrell, and Tim Tunstra… I bet there will be others as well so we are talking about a potentially seriously crowded race. I personally have mused that former city councilor Len Bodack might find a way to jump into the fray as well. Here’s the deal. The race to fill the unexpired term through the end of the year will be a special election which is going to be held at the same time as the primary. Messes this all up. In a special election, one candidate from the major parties is nominated by respective political committees. So folks who do not get endorsed by their party committees have a doubly tough choice. It is not uncommon in special elections to have folks declare themselves as independents in order to run against the one endorsed candidate. Win or lose they often would re-register once the election was over. But because the primary is being held at the same time, anyone who chooses to run as an independent in the special election will not be able to run in the primary leading to a full term. Got all that? Think it is rare or not as convoluted as it sounds. Who recalls how Doug Shields was elected? When Bob O. left city council there was a similar election that had a special election for his unfinished term at the same time as the primary for the full term. Then, in what may be one of the more neurotic political results the Democratic Committee endorsed Tom Sciulli for special the unfilled term, yet endorsed Doug Shields for the full term. The election results worked out just like that and indeed Sciulli took office for a few months yet Shields won the primary and took office the following January. Somebody from the district once tried to explain to me the logic behind all that.. all I remember thinking that whatever the explanation was it still amounted to some group borderline disorder. Yet could we have something similar happen again. So PA 20… I can’t begin to handicap it. To begin you might have the mayor’s brother vs. his former campaign manager for a seat which was in fact held by the mayor's grandfather and then by another he who will not be mentioned city mayor. Lots of history right there. Not to mention a certain county executive and gubenatorial candidates lives in the district which you think could have an impact. Then Purcell who came within a few votes of being elected to county council once but lost to Matt Drozd. Don’t know much about Tunstra or the other names being floated. For that matter don’t know much, and there is little in the record about the mayor’s brother. There even seems to be some debate with the general public over what name he goes by. Some argue that PA 20 is on a short list to be eliminated by the coming redistricting which would make this all a short term gig no matter. Lots of arguments for that. It is one of these districts that has been stretched into the suburbs as population in or near the city has decreased. It also will have a fairly junior rep no matter, and that always makes a district more vulnerable. By my estimation, Allegheny County will likely lose the equivalent of 2 state house seats following redistricting so it’s quite possible PA20 is one of them. The only reason to think otherwise is that there might be a rep or two that announces retirement in the coming year or so which would might leave those other districts without incumbents to protect when boundaries are withdrawn. We’ll see.. Redistricting is going to be a mess all around. So all there is to go on for figuring out PA 20 are the breakouts from the last really contested election in 2006. Here are the maps I did long ago on that election with the respective results for Walko, Purcell and Banahasky. I was watching something on the evening news this week about the job openings at the casinos in anticipation of table games. Everyone wants to be a dealer. Good pay, tips, and I guess it appears fun or something. I bet it's a lot of work and comes with a lot of scrutiny over all the money you have to handle. But I think there was a point made out at the meadows that there was a "perception that they were going to be flying in dealers from Las Vegas" and that it wasn't true... that they were really going to be training folks here to become dealers. I wonder though... Gaming in Vegas is on its back these days and there are probably more than a few dealers looking for work. 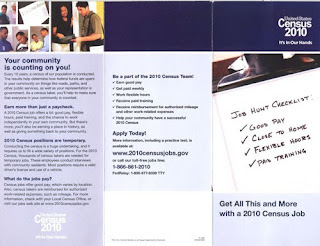 I wonder how deep the diaspora exists in Nevada and how many folks might really be looking for jobs out here with the new table games tsunami coming in Pennsylvania. If someone knows of a burgher native dealer from Nevada looking to come back for one of these job, send them over to Toland. We haven't seen an installment of his 'diaspora report' in a bit have we? and for the informal economy, let's call these Counting jobs... Why work if you can master the long defined optimal strategy for blackjack. Then again you also need to beat the new technology that will be there to thwart you. To think Nick Perry only needed a syringe filled with paint. Westinghouse's main competitor in the growing nuclear power plant market globally is the French company Areva. Lots going on in France and you can read some of their current problems in the WSJ today: Paris Urges Areva, EDF to End Spat. Of all the taxes being paid by the casino 2% of it's gross terminal revenues is slated to go to the city, another 2% is slated to go to the county. The city's budget and 5 year plan anticipate the following revenues to come from the casino. OK. You might say there is a bit of a problem with that. Only some has been transferred to the city as yet, but since opening the casino has been accruing on average $315 thousand a month in taxes which the city will eventually receive. $315 thousand/month comes to what? $3.7 million or so annually. Just a tad short of $10 million. It's actually half of the conservative $7.3 million antiticpated this year. That's not a problem in itself. The law covering all this says that the city will get either 2% of the gross revenues generated at the casino or $10 million per year... whichever is greater. So the city will be getting it's $10 million no matter. But there is an interesting question on timing. When is that shortfall in the promised $10 mil being put in the mail? Not quite sure where the $7.3 million estimate for this year came from. It still is a far cry from the $3.7 million annual rate that looks like what the tax is accruing currently, but for sake of argument you have to start with something. I'm pretty sure the $12.7 million anticipated in 2011 is the combination of $10 million expected to be generated directly from the casino taxes and an additional $2.7 million that is to be made up from the shortfall the year before. So.... what if in 2011 revenues via the 2% tax still come out to something under $4 million? They will get that and you hope a check to make up for what didn't add up to $10 million the year before. If it really is $2.7 mil, add that to $4 mil and you are still under 7 mil... So a net shortfall of over $5 million. In some long run steady state the law should guarantee $10 mil. annually. If revenues down at the casino don't ramp up pretty quickly there is some double counting of how much will accrue in the near term. I bet (no pun intended) there isn't going to be a year when the casino generates $10 million a year directly plus sends a check for the shortfall the year before. At the current rate the shortfall is on the order of $6 million split somehow between budget years 2010 and 2011. So again, assuming some big upswing in casino revenues does not happen real soon, the state mandated tax will not reach anywhere close to the $10 million slated for the city. How this all plays out depends a bit on when the check will show up for the shortfall. The promise is $10mil/year, but what definition of a year? Calendar year? Fiscal year? The state's fiscal year or the casino's fiscal year? and subsequent to whatever year is used, how long before the casino must send in a check for the shortfall? I'm sure that given their low revenues of late, plus their new property tax assessment, that they are dying to send another big check to anyone soon. This shortfall is going to be replicated with the county as well. The wonkeryinzerati can play with the data itself here if you like. Which is interesting because it seems to be a data issue more than anything else. According to some quoted in the article... Unlike elsewhere, Pennsylvania producers apparently do not need to report production the way they do elsewhere which is impacting lease payments. So if there was more data transparency the market would set a different price. Does this qualify as market failure? So, while everyone is tracking Orphan I I thought this would fill the interlude with a story on international adoptions in Pittsburgh. Some friends of mine who used to work INS (now USCIS) right here in Pittsburgh would always tell me that there was something of an urban legend down there that there must be some environmental problem here that kept fertility rates low. Seriously. The reason was that they said an inordinate number of international adoptions processed nationwide came through their Pittsburgh office... Thus they inferred a larger demand for international adoptions locally. Of course it was the type of thing that gets me wondering. It is true that when you benchmark this, the number of births locally is low. There are some real obvious reasons for it. An older and much more highly educated population both tend to decrease the number of expected births. Low international immigration also depresses local fertility rates compared to elsewhere in the country. Once you take both of those factors into account I think you explain most of the recent differences observed in birth rates in the region vis a vis the US. But back to my INS friends.. and this was some years ago for the record…. Not anyone who is down there now. I could never get them to give me some hard numbers to document their perceptions even. Probably is something to dig into a bit. My guess, and it is purely a guess, is that there may be more international adoptions that would be expected for a region our size. Also pure speculation, let’s call it a hypothesis, is that the regions long history and connections to Eastern Europe facilitated some steady flows of adoptions over some recent decades. So a speculative hypothesis to explain an unsubstantiated observation… nothing more. Just watching and praying like everyone else. This week's Newsweek covers the difficulty we seem to be having at completing the bike trail around Sandcastle... I thought there was progress? Said to be the remaining piece needed to complete the Great Allegheny Passage though there is a detour out there around the closed Pinkerton Tunnel. Reminds me.. I still ought to write up a trip report on the bike ride to DC last summer. It really is a new media world. From the Department of Defense Bloggers Forum (huh?) is a transcript straight from the source of what conditions the Air Force is working with at the Port au Prince airport. You can read the transcript verbatim. The Navy has more help on the way and the old quartermaster in me requires me to post this pic. The bottom line: lots of moving parts. Wired has a short piece highlighting tweets on the ground in Haiti. How fast are those table games starting up? Well, that was short lived. Past the holidays and casino revenues are back to where they were before. If things were to stay as they are now, or even if they were to double.. they would still be well below expectations. There are certain guarantees on how much in taxes are generated for both the city and county, but I think there are some real big questions on when those revenues will accrue. Some other time we can poke at that. Anyone want to compare the 5 year budget plan and what it anticipates in the form of casino revenue and what it is likely to get in the next few years? Anyway, see below for the latest. Just a question. How much of the bump over XMAS and New Years was made up of the vast Pittsburgh diaspora home visiting relatives? I wonder. I know. Table games will save us all, but with the taxes on table games locally pre-encumbered, the potential for more revenue coming to the city or county is minimal. You have to give Rich Florida credit. Very few people can stir a debate as he does. The most recent round of Creative Class warfare started a couple weeks ago with the article in the Prospect magazine that took the whole Creative Class thesis to task. If you have not seen it, you can read yourself: The Ruse of the Creative Class. The mere anticipation of that story was percolating in the urban planning scene at least a month before it came out. The article itself is now old news, and has been commented on by many including our own Chris Potter, but also see Ryan Advent writing at Seeking Alpha and Jim Russell. There is more. An even harsher recent criticism comes from Germany where Der Spiegel has it's own 5 part series that is as pointed as the piece in The Prospect. What really caught my attention was in part 4 there was some discussion on Duisburg in Germany's Ruhr Valley.. Germany's largest inland port and a veritable cousin of Pittsburgh. Looks like the Trib’s Mike W. is over in Germany and has been reporting back from the Ruhrgebeit. So it all ties together. I've noticed that the Pittsburgh part of the Rich Florida story is beginning to be forgotten. I've talked to some people who are surprised to learn that he spent so many years here. You could really trace the evolution of the Creative Class thesis while he was here. Somewhere in a pile of papers in my office I have his original report on focus groups he did with local young professional types looking at this question of what motivated them to stay or leave. A loyal NS reader has even told me about how he was recruited for one of the sessions long ago. That report might have been destined for the micro-readership that many of these things get, but you can really see how his 'eureka' moment came some time during those sessions. I often wondered if that one little project had not been funded how the Creative Class trajectory would have evolved, or if Rich would have wound up focusing more on other topics in subsequent years. Love him, hate him, there really is no middle ground when it comes to Rich Florida. Too short a space to really take up the core issues. My personal take is that if strip away some of the funkier (read anything labeled 'Bohemian') points the fundamental debate boils down to whether people follow jobs or jobs follow people. The former has been the paradigm since forever. The future may indeed become the latter. Where we are right now between the two is worth debating. It’s not a new debate and I have pointed out how some smart folks here at Pitt said much the same thing a half century ago.. Not that they were really listened to at the time. Long ago Rich had an oped here that focused on an idea that Pittsburgh would be saved if we would only build a rock climbing wall on Mt. Washington as a means to keep those young creative types in town. I give Rich some leeway that it was meant as hyperbole, but you can never be quite sure. Nonetheless it really did inspire the real start of my oped career a few weeks later with my rant against Border Guard Bob. Of course, Border Guard Bob didn't do much good at keeping Rich himself here, nor some of his acolytes. I once met a person who had inherited one of Rich's offices at George Mason University where he first fled to before moving on to Toronto. It was a conversation item that she said she had an office in a suite painted the only non-standard color at the university and the reason was its former occupant. Rich must have had it in his contract that he didnt have to live with the institutional beige on the walls. Not meaning to pile on.. it's just that I still think this is one of the funniest YouTube clips I’ve seen. So a good way to end the rambling is the video below which isn't really an anti-Florida piece at all really. You'll see what I mean, it may actually be one of the most creative clips out there on the subject. Otherwise you can also see the ultimate Yin and Yang of cool in a video clip featuring both Rich and I during the first season of WQED's OnQ. What is your Wecht Number? Maria has been playing with photoshop again and has a pretty funny cover image for The Six Degrees of Cyril Wecht for Governor. I have to point out that someone came up with at least the main part of that phrase last year. I really do think Cyril connects us all in one way or another... and connects us with the world. Your degrees of separation from Cyril is your Wecht number. What's yours? A study out today looks at the role of tax incentives in luring (or not) high tech companies in Pennsylvania. The full study is posted by the Keystone Research Center. I've ranted in the past on the use or misuse of tax competition here and nearby. Pennsylvania has a big role in the recent history of tax competition. Always worth looking at. update: The Wall Street Journal covers the report as well. Square in the Null Space nexus is news that the Rivers Casino here is finally assessed at all of $199.5 million dollars. On the scale of $ amounts we debate in town here, it should be big news. So what you say? We've pointed out before that high or low, the assessed value of the rivers casino would likely one of the single most valuable taxable properties in the city. At just under $200 million in assessed value the casino is slated to bring in $2.8 mil for the school district, $2.1 mil for city, and a lesser amount to the county. So you are talking about a new public revenue stream of well over $5 million being turned on theoretically into perpetuity. That would be more $$ than the entire revenue stream for the vast majority of local governments in the region. What is the full net present value of that new income stream? Once you have calculated that number it might be worth asking if sufficient resources were deployed to get the best and most defensible number.. According to that news story, the county ditched using an outside contractor and instead used its internal resources, in particular it's Chief Assessor, to set the value of the casino. First real question, was the anticipated new revenue plugged into the budget projections for any of the 3 local governments expected to get the 'windfall'. Windfall loosely used. If yes, then is the low valuation creating a bigger budget hole for any of them this year than was anticipated. If no, then does this new money solve a lot of other problems that we have been gnashing over. The bigger question. Should the city or school district appeal the assessment value? It might be a windfall in a sense, but is it the right amount? At a $400 million dollar assessment there is another $2mil that could go to just to the city itself, let alone the potential additional revenue for school district and the county. What was the magic number to keep the libraries open? Is there money being left on the table? Finally.. this is all out just in time to check in on the casino watch. I don't see the latest numbers out for the first week after New Years so keep an eye out. But the trends down at the casino are well below all expectations. So much so that you have to wonder the viability of it into the future. I have to admit I wondered if they were keeping their financial success early on limited in order to ensure they got the lowest possible property assessment. But that is awfully cynical, even if rational in a strategic sense. No a bankruptcy does not mean the casino will cease to exist... but a future bankruptcy would have lots of implications all around. If they were having cash problems down there already, what will it mean now that they now are about to be sent a new multi-million dollar real estate bill. Their interest reserve to make bond payments must be reaching near zero pretty soon by their own public admission. What then? Just in case you missed it... the most insightful Pittsburgh prognostication you need to read was in the PG yesterday detailing what to expect locally between now and 2025. Dare I add my own which is that Gary will be covering each of those stories in 2025 as well. Maybe Groundhog Day is the secret key to everything here. I finally got around to seeing The Chief, which as everyone knows is centered around the late Art Rooney, Sr. I know a lot of folks go thinking it’s about football, but I don’t think you could get a more concentrated firehose of Pittsburgh history any other way. Like all great art, it speaks to everyone differently. The play recounts how The Chief's early tenure in politics which centered around his work for State Senator Jimmy Coyne from Galway. Lot’s of Coynes from Galway in my family tree, and lots who came to Pittsburgh in the generation of the late Senator, yet I had never really heard of him. Midnight had me checking the known official family tree for any connection. I didn’t find it (yet). Whether I find a link or not I suspect when I’m 80, le cúnamh Dé, I will be recounting how my family helped Art Rooney along the way. If only it could get me moved up the waiting list for season tickets. Paz has a puzzler that nobody can get. On local government. In the spring I had a blog post drafted about this news item about the good folks in Louisville and Lexington planning to come visit us later this year, but I don't think I ever published it. I was reminded when a loyal NS reader pointed out this news item from WDUQ following the same story recently. Merger of Mill Towns Urged and then Steel Valley disputes authority of Pitt conference on area. and so with that a teaser. Support the dead trees and you might find something interesting in Sunday's PG on all of this. Sunday's early edition will be out on Saturday. Someone thought my nabobism on the city's iBurgh App reflected some anti-App feelings.. or anti-Apple or something like that. Not in the least. I really do own an Apple Newton. I admit I would take bids if anyone wants to buy it for a price reflective of the venererable antique that it is, but won't dream of parting with it if you offer me paperweight values. Seriously, no anti-Mac feelings at all. I can prove deep Mac roots. Plug in "macintosh personal computer" into the keywords here. But on Apps that have been working, I didn't realize that Routeshout is now an app as well as being a cell phone text interface. I think they even have a new website: http://www.routeshout.com/. Check it out. better yet, test it out if you are one of the routes it is implemented on. (I'm told it is implemented on all routes... so there) Someday the Port Authority will stream out real time GPS positions from their buses (I can dream) that will allow Nathan and company to take their stuff to a new level.. but for now it still does a yeoman's job if you need a bus schedule on the fly. Check it out. Should be some news stories on that. I think in technical public finance speak this is all called doubling down. I think more than a few predictions were a bit off. There is a great quote in there.. Something about 'wildly premature'. Next meeting in the ongoing assessment miasma is scheduled for later this morning. Could be routine, except that this video news segment aired since they the parties last met. I really do wonder if the Judge watches the evening news. Someone thought I may have not been fair to the Rivers Casino in that I have been pretty consistent in pointing out when their revenues have declined, but failed to mention it last week when their revenues showed some rebound. Fair enough, I think I just missed it with the unemployment news displacing my attention last week. In fact this week's data is out and it was a second weekly increase down there. In fact it was one of their biggest weeks since opening despite the weather New Years & Slots.. Perfect together? We will see what this week brings. But it was also pointed out to me that I may have been a bit unfair in always talking about Rivers and not about the trends elsewhere and in particular at the nearby Meadows Casino. 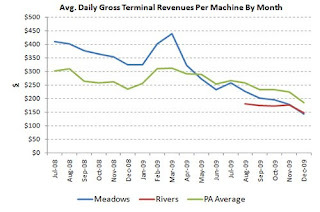 Ok.. Below is the long term trend in the same metric (average daily gross terminal revenue) for the Rivers Casino, the Meadows Casino and the statewide average among all casninos for good measure. It really may be the case that the trends out at the Meadows are a lot more problematic than at Rivers. If I have been ignoring that it is not just that it is farther away, but I don't think the Meadows is supporting as much other local stuff such as the payments to the SEA for the arena bonds and other commitments. Those commitments are not only real costs to the folks running Rivers, but at the end of the day if they are unsustainable there will be repurcussions all around. This graphs the monthly averages, so it looks different from the weekly averages I have been showing. The monthly numbers are obviously a bit less spiky. 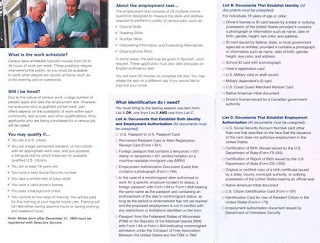 Here is some news on what will be happening in 2010. It may have been one of the first posts here on the idea of LST 325 visiting Pittsburgh and now it may be happening. At least tentatively on the schedule is the arrival of LST 325 to Pittsburgh sometime in the early fall. 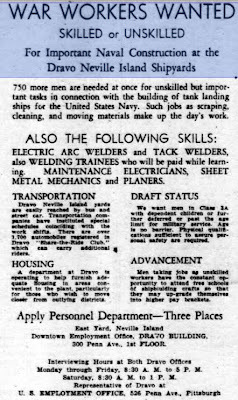 See some of my past musings on the significance of the local shipbuilding industry in War War II in this past post, but also mentioned in this old oped in the PG. 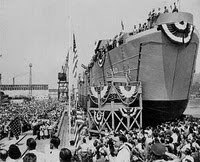 On the left is a picture of LST 750 which was built right here on Neville Island. Not it's official name, but the ship was called by some to be the USS Allegheny County because it was built with money raised locally. It would be built here in an amazing 2 months during April/May of 1944 and was launched on May 30. It would be sunk by a kamikaze off the Philippines just 6 months later. I am not quite sure how it even got out to the Western Pacific that fast. How busy were the folks here making ships (and most everything else) back then? I really am not sure what the local advertisment below was supposed to do. I am pretty sure by 1943 every conceivable worker was employed somewhere. Note how they wanted married men with children which is because early in the war that would exempt you from the draft. Later in the war exemptions for men with dependents would go away. I was going to try and diagram all of the shifting quasi-alliances and anti-alliances that have been driving the quicksand that was the race for the presidency of Pittsburgh's city council.... but I just couldn't think of a way to show it all. I know the spasm of the moment seems like the only issue on the table... But the election of the next city council president has a lot more significance than is typical. The next city council president will have a lot to say over how city council districts are reshaped following the census coming up soon. How that goes may shape how politics in the city works for the next decade or longer and could impact all issues before council.. In that sense it trumps any one issue by far. For one thing, does anyone ever wonder why the city only has two conceivable minority districts while the school board has almost always had 3 minority members? Right now the district actually has 4 minority members though one was appointed. Given that the school district includes Mt. Oliver with a smaller minority population than the city, it should be harder to have 3 minority districts in the School District compared to the city. There has been a lot of population change in the last decade, and it surely has not been even within the city so there will be some palpable differences in the districts when they get drawn. Even without getting into specifics, it sure would be good to hear if any of these ever-changing council president hopefuls had any thoughts at all on the issues that will come up in redistricting within the city. In fact, it would be something if any of them ever mentioned the issue publicly at all. It may be the most important thing they literally have control over during their term. See the story on iBurgh 2.0 today: iBurgh app takes its place at last on iPhones. I guess 1.0 was direct to the Apple Newton or something like that. all I can say is go reread my comments last summer on that. Then maybe reread it again. Yes that was 6 months ago. I'll put this another way. and there is something I don't talk about too much, but somewhere along the way I actually have a degree in electrical engineering so I do know a little bit about technology. That and the way government works I've gained at least a bit of knowledge on. Pick whichever funky term of the moment you want. Transparency to Digital Citizenship or eGovernment if you prefer... Really important things, but none of it is about the technology. In a way it is not that disimilar to economic development. We can pursue lots of things, but there still is this tremedous need for infrastructure. If the roads and the utilities don't support growth then whatever else you are doing does not amount to much more than window dressing. Or take your house. Hopefully nobody buys a house with a neat exterior, but unworkable wiring. I think the real estate folks call it the buidling's 'bones' and it really matters the same way. Same is true for information and a lot of work needs to be places on data infrastructure long before you dedicate time to the front end. That and I'm tempted to offer a prize for the first iBurgh submission geotagged to Fairywood. Yes, that is a City of Pittsburgh Neighborhood and has been for a long time. Poor device would probably suffer from a case of cognitive dissonance if you tried. Hopefully it wouldn't go HAL on us. and they have a companion piece with quotes from Burgh migration sage Jim Russell : Lessons from the 2000s beckon. Will we heed them? So again, as all our hopes rest on the success of the casino, the folks in Las Vegas look to us for answers. Go figure. 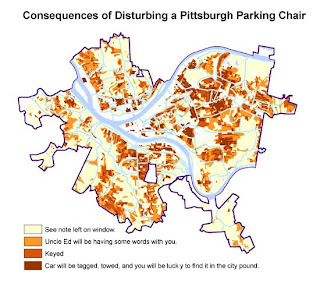 What does the spasm last night in city council say about the future of Pittsburgh? Too much, unfortunately. So that at least one person reads to the end of this, here is a teaser for the ADB: Would Henry George have supported the prevailing wage bill? It seemed pretty obvious to me the city’s prevailing wage bill was going to be vetoed. That nobody was talking about the impending veto had me quite confused and I really wondered if I was missing something. As conflicted the machinations Downtown seem to be, the results rarely stray from the expected at the end of the day… Though don’t expect me to predict who will become CC prez, something that has been the most unpredictable of things for the last two decades. I had forgotten, but was reminded that we all came within a nanometer of having Twanda C. elected as City Council Prez not long ago.. something that would have put her in a position to have become mayor on the passing of Bob O. If that had happened I wonder whether we all would have ever heard of Mr. Lee Otto Johnson. And that impending Democratic primary for governor here in Pennsylvania? It all looks to be just a less contentious replay of the fight here for CC prez in the early 1990’s. I digress. Prevailing wage bill. My proof that it was going to be vetoed came in the form of the 9-0 vote City Council passed last week on this. City Council is rarely so unanimous, and certainly not unanimous on something like this. I really figured that the message went out that folks could have free vote in a sense and approve the bill knowing it would not survive. I am surprised that given the recent legal developments which make the survival of the bill a bit uncertain that the Mayor himself didn’t see the free nature of signing the bill even if he opposed it..
My take on it all is that the compound lame duck issues made this all a dubious thing to take up so late in the year no matter. Even those who wanted to support the bill in some sense don’t want to let outgoing CC prez get any fillip of credit on it. On that point alone I am not sure why anyone thought the bill would be signed this session. That being said, I think Shields as cc prez has to take blame to bringing this forward so late in the year that it facilitated the lack of options they were left with once the mayor vetoed the bill. A big topic and the prevailing wage bill has some overlap with issues on the parking tax. It is actually true in itself that a bill like the prevailing wage bill ought to be based on a larger geography if at all possible. That is if you believe in the merits of the bill at all which I realize many do not. But given the 9-0 passage in council I’ll take for sake of argument that it has a philosophical level of support in the city. The city’s core pathology remains it’s geography. As a really small place in a larger and larger region it is quite true that anything that makes the city uncompetitive puts it at a distinct disadvantage to its neighbors.. and unlike almost any other region in the nation it has a lot more close in neighbors to deal with in that regard. It is the same argument you hear about parking tax issues and now the related topic of parking garage leasing and the potential for parking rate increases in the city. In fact, I would place good money that the potential parking rate increases that will likely occur from leasing the parking garages will have an order of magnitude bigger impact on business location decisions impacting the city compared to the much narrower impact the prevailing wage legislation could ever have. Think about that some. But… and it’s an enormously huge but… there is this question of whether the city is suffering from any such disadvantage now and whether it would be hurt more in the future. I really swear that everyone in their psyche keeps confusing the story on the city's population (down in the past, going down now, probably going down in the future) with the story on the number of jobs located in the city of Pittsburgh which really are as stable as the rock of Gibraltar. Again the factoid: 300K jobs located in the city in 1960… same as today give or take some noise. If you realize the two trends are different then you get to some very different policy conclusions on just about every issue in local public finance. The city honestly has lots of things that could make it a disadvantage to many a business. Parking fees of any kind are a killer for folks who like to drive to work and parking is nominally free for most suburban locations. In Downtown and Oakland that will never be the case. Other fees and taxes, inherently more restricted zoning in dense urban environments and innumerable other reasons make it hard to attract a new business to locate in the city proper. Yet the jobs have remained. Go figure. Understanding that is the key to understanding most everything about the future of the city. Why do jobs act so irrationally and stay in the city? One could argue in Oakland it is a preponderance of tax exempt investment that anchors them to their location. A fair enough argument, but not something anywhere near as true for Downtown which continues to be one of the densest jobs centers in the nation. So again.. Why? There are lots of details, but when you get to the core of it there must be something valuable in the location that makes businesses willing to put up with all the unique costs of doing business in the city. The debate over the prevailing wage, or the parking tax for that matter, needs to account for the fact that there are lots of other factors in play. The fact that businesses are willing to put up with the parking rates, the parking taxes, the congestion and all the other city hassles is remarkable. In Pittsburgh there are relatively easy options to put jobs in Bellevue, Baldwin, Greentree… the list is long, vice the city proprer. Yet again, they don’t for the most part. There really must be something in the value of the land and where that land is that keeps jobs located in the city. So if you have gotten this far what does it mean? The arguments over a prevailing wage or parking rates are not as they are portrayed by most. Will the city be less competitive as the result of higher costs on businesses. For sure, that is almost a tautology. But in Pittsburgh’s case there is ample proof those costs are things many are willing to live with and continue to invest and do business in the city. I’m actually not sure the city can support a job base higher than 300K which again is a remarkable number of jobs for an urban core city given it’s size and history. The issue for the prevailing wage or the parking tax is thus something else. For the prevailing wage it becomes a more classic labor-management issue of how the economic rents (rent in the broad economic term) derived from the intrinsic value of city-located land gets distributed between owners and workers… for the parking tax issue it’s about how those rents gets distributed between the owners and the city. It's not about the return on investment, but the profit merely derived from location. So no matter if prevailing wage passes or fails, or if parking rates go up or remain stable, I bet the core number of jobs in the city remain much the same… how profitable for those who own the land (which in many cases is the public these days... dare I mention the stadium authority), or can gain control of the land are the questions… and profitable for whom. But if you read that far and want a simple take on the merits of the prevailing wage bill as it currently is being proposed. If it were to be enacted and if it is as calamatous as some predict, the impact should be hard to miss in short order. There is no reason it could not be rescinded or modified once there was evidence that it was creating net job loss in the city. I was just wondering.. how long has it been since anyone on city council even knew who Henry George was? One could argue this was once the center of Georgist philosophy, and the most George-knowledgable politicians anywhere. Today?